In August 2016 a storyteller will find he has a legacy in an all new LAIKA animation studio movie, “Kubo and the Two Strings.” Armed with his most trusted weapon, his shamisen, Kubo must go on a thrilling quest to save his family and unlock the secret of his legacy. 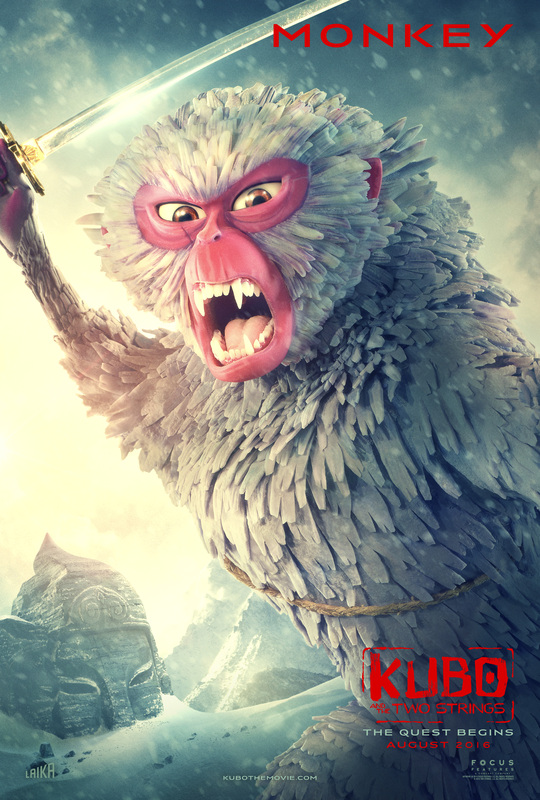 In preparation for Kubo’s epic new adventure, Focus Features has released THREE new posters featuring characters from the movie and an all new trailer! Check them out below and start getting prepared to watch a hero’s thrilling quest to master his powers and become the hero he was born to be. 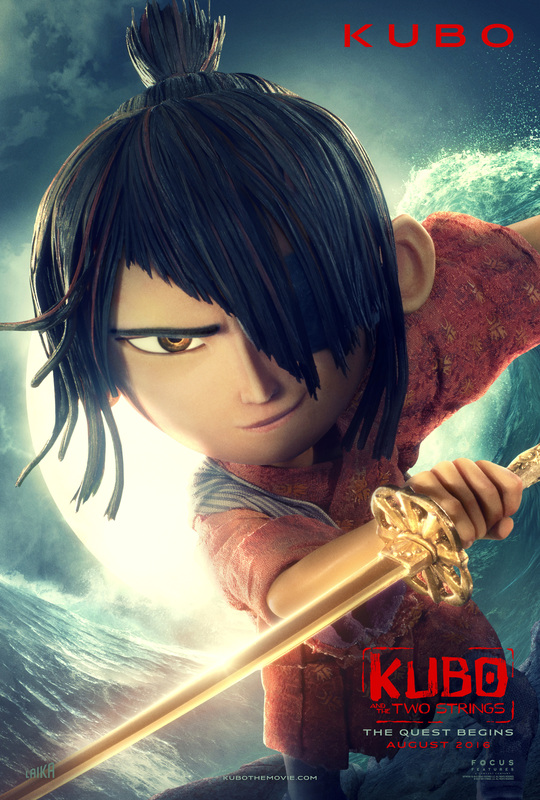 The story is about a clever, kindhearted Kubo (voiced by Art Parkinson of “Game of Thrones”) that ekes out a humble living, telling stories to the people of his seaside town including Hosato (George Takei), Akihiro (Cary-Hiroyuki Tagawa), and Kameyo (Academy Award nominee Brenda Vaccaro). But his relatively quiet existence is shattered when he accidentally summons a spirit from his past which storms down from the heavens to enforce an age-old vendetta. Now on the run, Kubo joins forces with Monkey (Academy Award winner Charlize Theron) and Beetle (Academy Award winner Matthew McConaughey), and sets out on a thrilling quest to save his family and solve the mystery of his fallen father, the greatest samurai warrior the world has ever known. With the help of his shamisen – a magical musical instrument – Kubo must battle gods and monsters, including the vengeful Moon King (Academy Award nominee Ralph Fiennes) and the evil twin Sisters (Academy Award nominee Rooney Mara), to unlock the secret of his legacy, reunite his family, and fulfill his heroic destiny. These three posters feature Kubo, a boy who is on the run from gods and monsters and faced with challenges beyond his wildest imagining, and Monkey and Beetle, two characters that Kubo can rely on as his most loyal and trusted companions. When they’re not bickering with one another, they go to any length to serve our young hero. Check out the posters below. Feel free to download them, they make epic wallpapers. 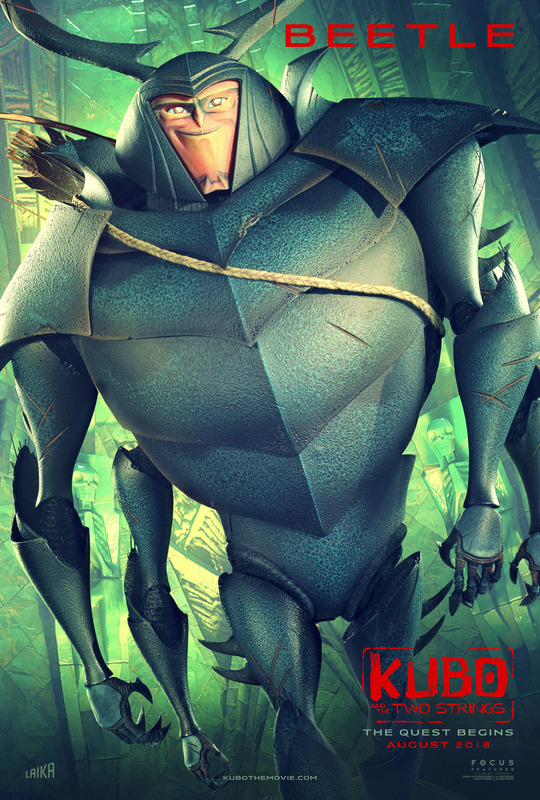 For more information about LAIKA’S Kubo and the Two Strings head over to their @Kubothemovie on instagram and check out all their cool posts.